Do you remember those big bauble necklaces that looked kind of like a bib and made you feel a little like Cleopatra? Some of you I'm sure are shaking your head at the remembrance! I totally rocked a few of these statement necklaces back in the day. But when I cleaned out my jewelry box recently, I either "gifted" these necklaces to my daughters to play dress-up or donated them to Goodwill. The problem with these big statement pieces is that they are fleeting fashion trends. What you like one year, you may not like the next. So now, Instead of turning to big statement pieces, I love to layer several delicate pieces together to create a I just "through these on look". The key here is to pick simple, timeless pieces that can be worn alone or together to create more of a statement. Choose pieces that speak to you and tell a story for you. 1. Choose a necklace that is already layered for you and only has one clasp or choose necklaces of various lengths that can be worn together. 2. Don't worry about wearing all of the same metal color - mixing and matching is A-Ok in our book. 3. Layer the pendants from the smallest on the top to the largest on the bottom. Lariats should go on the bottom too. 1. Choose bracelets with various sized beads to achieve dimension. 2. Around here, we love to wear bracelets in odd numbers. We typically stick to three bracelets on one wrist - and maybe one more on the other wrist if your feeling spunky! 3. For a casual day-time look, I like to stack all beaded bracelets together. And for a dressier, evening look, I like to stack several chain bracelets together and leave my beaded stackers at home. 1. The daintier the better here! We like to layer 3-5 rings on a hand. 2. Feel free to mix metals, stack multiple rings on one finger, or spread them out onto individual fingers. We even like to rock a midi (knuckle) ring every-once-in-a-while too! And most importantly, have fun with it! 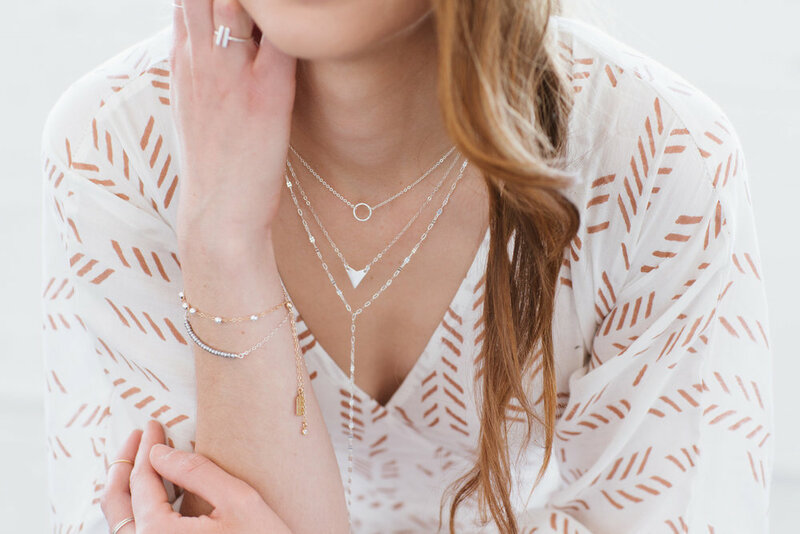 There are no real hard and fast rules to the art of layering jewelry - just go with what feels right and makes you happy!